I went swimming yesterday. Sadly the pool I frequent doesn’t look as grand as the cathedral-like Mk Berlin Stadtbad, but I always leave feeling as though my soul has been restored. Recreation in the true sense has taken place as I plough up and down the slow lane. Recently I’ve been trying to reeducate myself in breathing. Since I learned to swim front crawl (about 36 years ago) I’ve always breathed to my left. It feels natural and “right” to do this and I’ve swum miles without ever feeling the need to look to the starboard side. Now, though, I want to shake things up and learn some new technique so I’ve decided to alternate my breathing between the left and right side. Easy, right? Nooooo! It’s difficult to break the habit of 36 years and I’ve had to analyse how to take a breath in order to avoid a mouthful of chlorine and a lungful of panic. It’s hard work. It doesn’t feel natural. But yesterday I began to feel I was getting it, and I had a minor sense of triumph. Noone else would notice but I’d spent some time making a radical change and I’d broken some bad habits. Hopefully my front crawl will be more elegant and efficient as a result. Which is all good and well, but what does it have to do with creative foolery? I’ve been thinking a lot recently about missional discipleship and asking some hard questions about what it looks like to live as a creative disciple of Jesus in the 21st century. And I think relearning how to breathe has something to teach me. I want to be a more elegant and efficient performer, writer and disciple of Jesus, but it doesn’t just happen without working at it. First of all, you have to decide that you want to change. It’s easy and comfortable to keep doing what you do the way you’ve always done it. This is true whether when it comes to making a lazy acting choice, writing a sketch with a predictable outcome or assuming that by “doing church” a certain way people will somehow find their way to Jesus. Creativity is often about not making the predictable, familiar choice, but choosing something different. So, the best actors are the ones who captivate you with their bold physical and vocal choices and the best writers are the ones who surprise and delight with the unexpected. And the most creative disciples? Perhaps they are the ones who remain open to the new things that God wants to do, and sense that there is reward in breaking old habits. Jesus talked about the new wine of God’s kingdom requiring new wineskins. It’s a bit like breathing in a different way. Of course there are good habits too. So, when I breathe to the left, I do it well. I’ve been practising it for the last 36 years. And, in finding a new rhythm, I have discovered that I need to recognise and learn from the good. This is about the discipline of creativity. In acting, the performer’s body is their instrument, so there is merit in maintaining good habits of physicality and vocal training, of staying open and responsive to other performers. In writing there is the discipline of structure, form and language that creates the freedom to express depth. For the missional disciple, there is the rhythm and discipline of intimacy with God. I have nothing to offer the world if I do not start from the place of prayer, Bible study and listening to the voice of the Spirit. And these practices take discipline, especially for activists who wake up with 12 ideas of how to change the world before breakfast. It’s no good just rushing in with a good idea and hoping God will bless it. It leads to failure and disappointment. So to become an effective creative missional disciple there are some habits to break and some new habits to establish. Habits we can learn from ancient rhythms and practices. It doesn’t feel natural at first, but the more we do it, the more we create from a place of security, intimacy and clarity. Having flirted with various forms of blogging and communication over the years it seemed sensible that at last the fool should speak up. So here I am. I work for a company called Foolproof, and we like to think we have things to say that you might want to read. I’d like to make you laugh, cry and think about what really matters in life. That’s the job of the fool. Why the fool? Well, historically, the fool serves as the truth teller in the royal court. Through jokes, tricks and comedy, the fool has the power to challenge and provoke with impunity. The fool is a clown who bursts the bubble of pomposity and challenges the accepted norms. 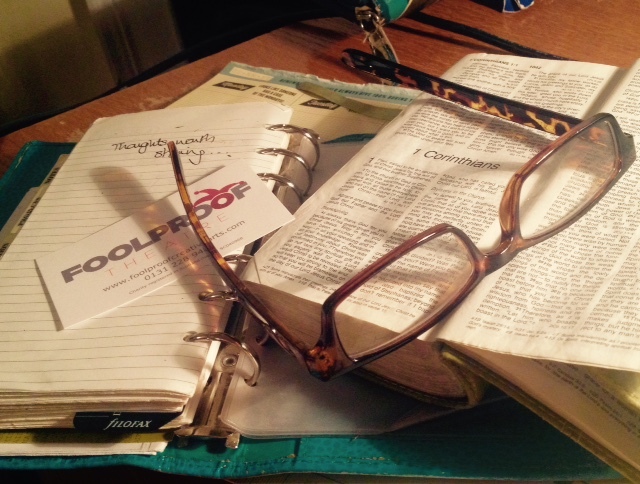 At Foolproof Creative Arts we want the foolish things to challenge and provoke our culture. We believe that we have been given a foolish upside-down, creative message to share about a God who chooses lay aside the riches of heaven to get involved in our lives.